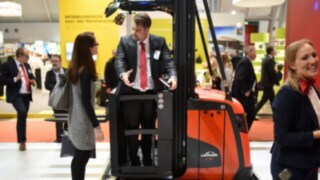 The Linde K-MATIC autonomously driven turret truck is suitable for loads of up to 1,500 kg and lift heights of up to 12 meters. 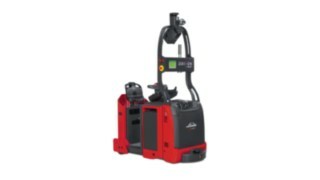 The intelligent geo-navigation system guides the K-matic safely without additional guide rails in the floor or laser reflectors, and is compatible with all common narrow aisle applications. 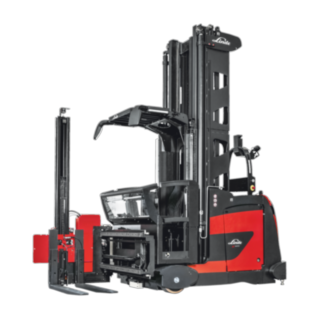 Whether as an individual truck carrying out defined process steps, or as part of a centrally controlled fleet of robotic trucks, the superior functionality of the K-Matic provides high handling performance even for complex operating requirements. When doing so, the truck interacts seamlessly with the customer’s infrastructure, such as belt conveyors or packing stations. 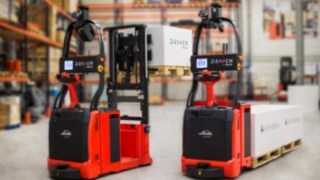 As an autonomous logistics truck, it mitigates damage to loads and pallets and is particularly well-suited to the handling of high-value goods. 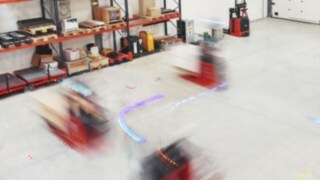 Quick and easy to maintain, the robotic truck can be relied upon to be ready for use round-the-clock and can also be operated manually by a driver. 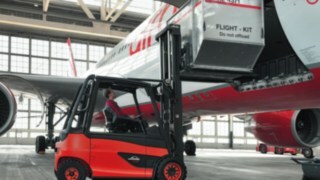 Using its own on-board safety system, the self-controlling K-MATIC forklift reacts sensitively to its surroundings: Independently of the navigation technology, laser and camera-based safety equipment steer the K-MATIC safely through its surroundings, reliably detecting people or other obstacles as it does so. The self driving very narrow aisle truck is also equipped with emergency stop buttons and acoustic warning signals and flashing lights. 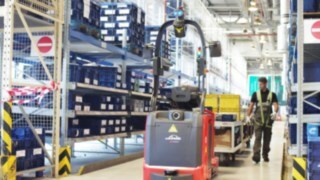 The automated K-MATIC very narrow aisle trucks are controlled by Supervisor software that optimally coordinates the tasks and routing of all MATIC trucks in use. The system is compatible with all major warehouse management and ERP systems and converts the necessary materials flow into movement tasks. 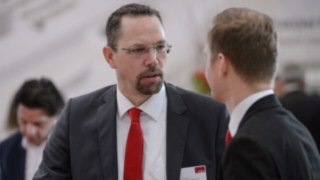 Trouble-free shelf stacking and removal processes are assured thanks to 3D pallet recognition with integrated distance monitoring. 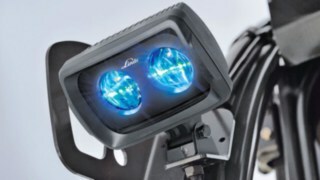 What's more, the laser and camera-supported safety system guarantees that the very narrow aisle trucks can also move around in areas with normal operating traffic without any significant loss of time. In this way the areas being monitored around the truck are adapted to the speed of travel and steering angle. If the truck has stopped because an obstacle has been detected, it continues with the task as soon as the way is free again. Changes to the work environment can be remapped in a short time thanks to the laser measurement and stored within the system. All significant truck and task data can be called up on a 7” LCD touch-screen display on the truck itself and read out via a USB port. 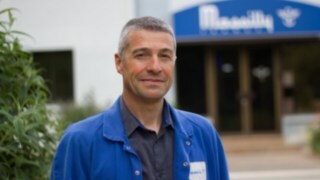 By entering a PIN, the technician activates the service mode and can safely carry out the required servicing tasks on the easily accessible components. Truck data that is relevant for maintenance is transmitted via wireless link and evaluated by diagnostics software. This enables forward-looking servicing – wear and minor damage are recognized early, and the required inspection intervals and parts replacement are calculated and planned. This ensures the maximum availability of the autonomous truck. 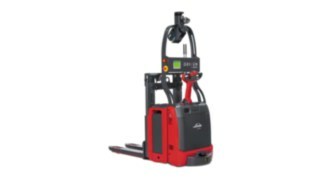 Linde provides a battery trolley with robust rollers for lateral battery changing. 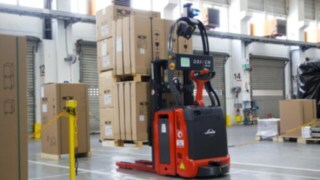 Various battery sizes and mast variants are available for the K-MATIC very narrow aisle truck. This enables optimum adaptation to the particular operating requirements. Thanks to the powerful LED lights of the Linde BlueSpot™ employees are alerted to the approach of a truck in an unintrusive, but effective way: No loud noises, no shock, no risk. The lift height can be limited electronically, preventing damage, for example to warehouse ceilings. When fitted with safety lasers, the K-MATIC can change aisles independently and so can be used more flexibly. 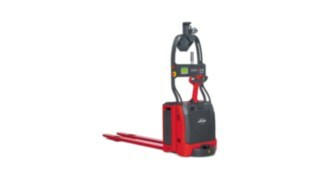 The fork width can be adjusted manually or hydraulically to store or remove differing load carriers.